Today’s comic is from April 3, 1974. It’s from Archie. Back then a lot of kids tried to go barefoot in school (as opposed to the 1930s when many kids didn’t have to try—they just did). But this comic also points out another silly concern of the authorities. 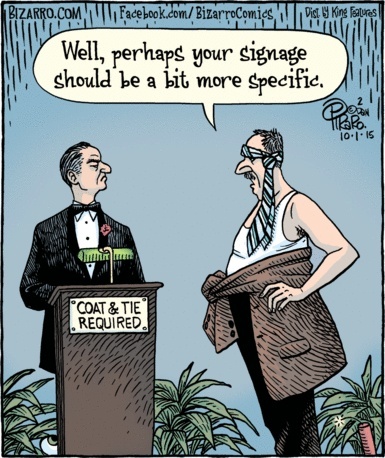 For today let’s go with this Bizarro comic from October 1, 2015. The writer, Don Piraro, always has a different take on things. While this is not directly related to barefooters, I suspect many will recognize the technique portrayed, or at least the desire to use something like it. This comic, from Pickles, just appeared a few weeks ago, on April 28, 2016. Yeah, shoes are like that, where you just don’t notice what they are doing. There are some dangers to going barefoot, as this June 26, 2012 comic from Red and Rover shows. On the other foot, this is something you’ll do only once.